Earlier this year I published a “State of Elm” survey. 644 people answered. This post details the results of that survey. First of all, let me supply a big fancy warning: I am not a data scientist or statistician. As I said about myself in the talk on this topic to the Chicago Elm User Group: “I don’t even play one on TV!” Still, this was an interesting project, but take my conclusions with a grain of salt. If you are a real data scientist, please let me know. It’d be great for someone with that kind of background to look at these data. In which domains are you applying Elm? This one I kind of expected to fall where it did. Most people use Elm for web development, then games and graphics. There were several people who said they weren’t using Elm (but, as we’ll see later, they want to). What is your primary Elm development environment? Of these options Vim was the most popular, but not by much. These results confirm to me that there’s not one clear “best” editor for using Elm. One surprise was the Visual Studio answer, which those 18 people all wrote in. How long have you been using Elm? This figure encourages me. We’ve got a lot of people who just started using Elm. The language also seems to have some sticking power to people who are continuing on. Of course, there are also the four people who have been using Elm longer than 3 years. Wow. What is your level of functional programming knowledge? For what kinds of projects do you use Elm? We included this question to gauge people’s level of involvement in Elm. It’s not surprising to see this level of engagement (mostly tinkering or side projects). A new language is always a hard sell in a company, especially a young one like Elm. Which versions of Elm do you use in production or development? This is a huge amount of people using the most recent version. This survey shows data from shortly after the release of Elm 0.16.0. I imagine that now the percentage in favor of that version would be even higher. Which browsers do you target? This one is a mixed. Far and away the most targeted browser is Chrome, but the IE family is making a strong showing here. Most people ticked all the versions of IE they support, but I’ve retained the question wording here (i.e. 9+). Firefox and Safari also have some support. What tools do you use to compile/package/deploy/release your Elm apps? The same percentage of people who are using Elm for hobby and side projects took this answer. Note the response “rails sprockets :(“. I couldn’t bear to take that poor person’s sad face out of the data when scrubbed it! Good point, and thanks for the catch! 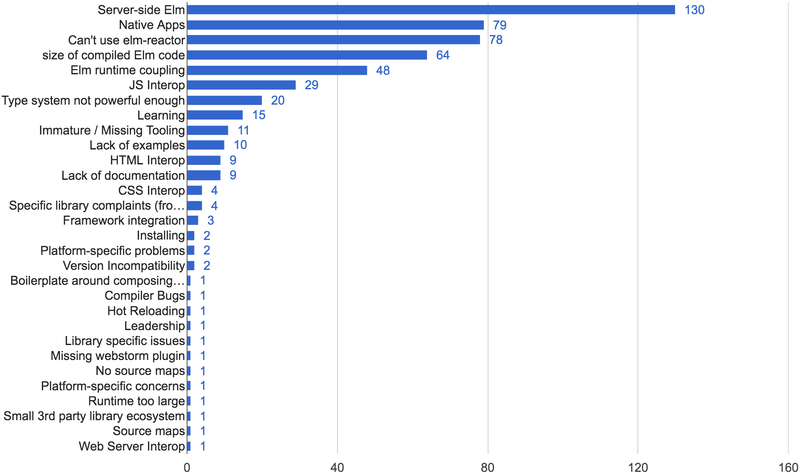 Webpack, gulp, brunch, grunt, gulp, and broccoli taken together account for 293 responses, which would put those types of build systems in aggregate in second place. What has been the biggest pain point for you in your use of Elm? Which one of the following languages would you choose to power your backend? There are quite a few missing languages here, as well. PHP doesn’t even show up, for example. People just didn’t write them in. EDIT: As Amitai Burstein points out: Drupal is, in fact, a PHP framework. Thanks for the correction! Time for a big mea culpa. One of the options initially read “Eastern Europe (including Great Britain)“. Plus I completely forgot to include South America. To correct the Europe issue, I’ve grouped the answers by continent (minus a few outliers.) To everyone who wrote in “South America” before I remembered to add the option: I’m sorry for the apparent slight. I know you exist, promise! Thanks for correcting me. Now that’s done, we saw the highest rate of responses from North America and Europe. A fair amount came from Asia and Oceania, and a few from South America. This is one question that really could use a proper data scientist. I intended to extract seniority and area of responsibility from these. But of course this is the internet, so I got answers like “Ninja” and “Senior Business Deputy Second Vice Fourth Level Prime Enterprise Archon Thrice Removed”. There was also too much data for me to scrub in a reasonable amount of time. And most of the titles didn’t state seniority at all. To get any value out of this data, I separated the titles on spaces to extract terms. 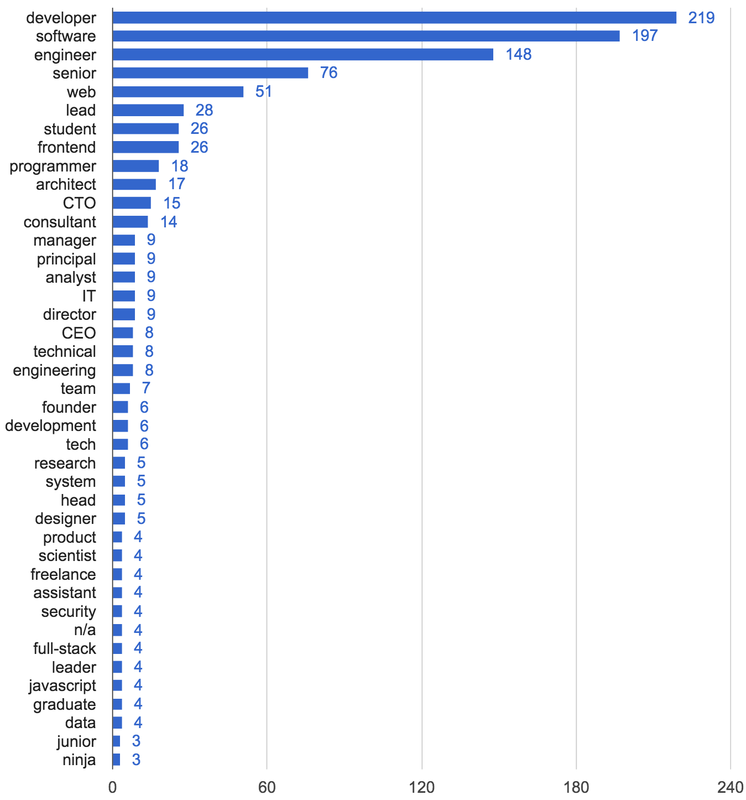 The respondents were mostly “developers” or “engineers”, and “senior” and “lead” made frequent appearances. We also have a few C-level people looking at Elm, and quite a few students. Oh, and respect to our ninja friends. I look forward to some excellent libraries, delivered in the dead of night. That’s all for this year’s survey. Stay strong, Elm community! Thank you to Richard Feldman and Evan Czaplicki for their feedback on these questions. Thanks to the State of Clojure survey team for the inspiration (and questions). Finally, thank you to everyone who took the survey and shared it within their network of Elm-loving friends and colleagues. Y’all are awesome.